In France the first of May is Labor day (la journée du travail) and traditionally the day of Le Muguet, as I already showed several times here, but it's also the day unions demonstrate in the streets. One of the demonstrations passed right be my place so I did not have to go very far to take this photo! 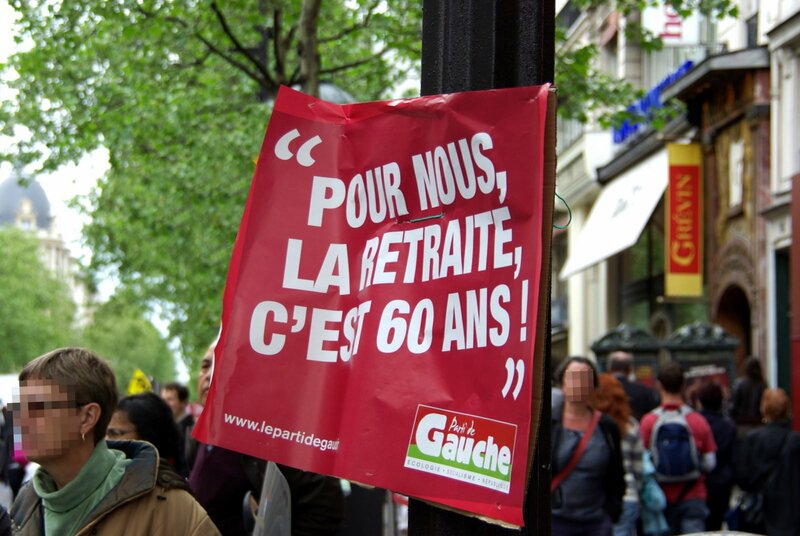 The big sensitive topic at the moment is La retraite (retirement). The Government can no longer pay! So they are trying to either postpone the age of retirement (which is currently 60) or lower the pensions, or increase the contributions (the French pension system is very largely a "pay-as-you-go" system where the younger generations pay for for the older ones - read this if you're interested to know more), or anything that could allow to make ends meet! Now here's am issue I can demonstrate for. And if they ever tell us they can't pay our Social Security, I'll be the first one on the bus to go march on Washington! Sounds like the US social security problem! I like the red- instead of the communist idea it makes me think people are angry! I'll bet they are. Guess this means I should wait until I retire to move to Paris? No, never give up a dream. I hope they find a solution. Nice picture and history lesson. Seems like the way of the world these days. Eric, wonderful I've just found your blog so now can get my daily 'fix' on Paris. As I'm v new to blogworld, am I permitted to use one of your photos on my blog with a link to yours? or is this a no,no? I would love to be there for May day, have been in the past and it all looks lively (when isn't Paris full of life)? Thank you for sharing your photos of Paris life! It sounds very much like the U.S. social security system: current workers are paying for the people who are now retired. However, our government consistently has "borrowed" from the social security funds, and this is one of the problems with the system: lack of money. I love how people demonstrate so often in Paris. I work for government, and I can tell you that elected officials are often blind to the realities they are creating. Workers of the world unite!....I am so sad, I'm a freelancer and can't strike.....by the way, where the shops open in France? There was a demonstration in Estonia yesterday and it was also because of the age of retirement. As I can see it's important problem in many countries. But I think that generally celebrating May Day as Labour Day in Estonia was more popular years ago. For last years we have had nationwide clean-up campaign on the 1st of May. And me - I celebrate May Day as spring holiday and eat cake and sweets, because 1st of May is my birthday. Btw I'm for a retirement pretty late in life... Okay I can understand everyone does not agree... Don't throw tomatoes;). Thank you for this new post, Eric. Interesting post, Eric. Our Labor Day is in September, signaling the end of summer. I haven't given too much thought to retirement yet; I don't have an "outside the home" full time job, so I'm not really eligible for our retirement system unless I work more after the children are grown, which I will probably do anyway. Here, if you're a stay at home mom, you don't "work" in the eyes of the government. Ha, I beg to differ. Raising intelligent, self-sufficient children is a hard job. The sign reads, "For us, retirement is at 60 years old"...come on guys, are you serious? @Roses, Lace and Brocante. Yes, yes... You can take all the photos you want, as long as you credit them (ParisDailyPhoto.com). @Louis la Vache. I already thanked you on your blog, but let me do it again. @Jeff. "It sounds very much like the U.S. social security system: current workers are paying for the people who are now retired." And doesn't it remind you of something?!. @Marleen "There was a demonstration in Estonia yesterday and it was also because of the age of retirement. As I can see it's important problem in many countries." Yes, simply because of the "age pyramid" in a lot of countries. @Flore. You went to the Apple Store?! What for? Buy an iPad!! You know the launch has been postponed right? @Michael. "The sign reads, "For us, retirement is at 60 years old"...come on guys, are you serious?" I think the problem is not really the age of retirement, it's the number of years you've worked. Say if you started at 25 like I did, I think it is fair that I retire later than someone who started at 18 for instance. hahaha, the dutch would immediately go for retirement at 60. In our country the age is 65 and its clear for everyone that is going up one way or another. Or you will have less money when you retire. 30 yrs ago (no kidding)I already learnt at school that our system (like the french our working people also pay for the ones that retire) simply cannot hold. it's just that no politician wanted to burn his hands on this subject and they all postponed it. Coucou! ;) Just popped over. I expected a picture about lillies of the valley and romance...Non? Is this still happening?